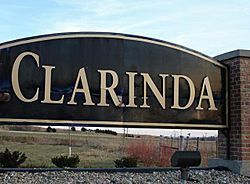 Motto: "Honor the Past...Imagine the Future"
Clarinda is a city in and the county seat of Page County, Iowa, United States. The population was 5,572 in the 2010 census, a decline from the 5,690 population in the 2000 census. Clarinda was founded in 1851, and incorporated on December 8, 1866. Many stories are told of such notables as Jesse James frequently passing through. The town is named for Clarinda Buck, who according to legend carried water to the surveyors while Page County was first being surveyed. The best known national firm in Clarinda for many decades was Berry's Seed Company, a mail order farm seed distribution business founded in 1885 at Clarinda by A. A. Berry. Berry's Seed Company diversified into retail stores in the 1950s, but the stores were sold off over the following decade, and today the company, known as Berry's Garden Center, operates from its one remaining retail outlet in Danville, Illinois. In 1943 during World War II, an internment camp designed for 3,000 prisoners of war with sixty barracks and a 150-bed hospital was built in Clarinda. German prisoners were the first to arrive at Camp Clarinda, followed in 1945 by Italian and Japanese POWs. Camp Clarinda was located by what today is the town's municipal airport, Schenck Field (named for aviator/farmer Ray Schenck, who built the original Clarinda Airport on the location). Early in its history, Clarinda was served by railroads from 5 different directions - all were predecessors to the Chicago, Burlington, and Quincy Railroad (CB&Q). In 1946, service was lost on the east-west line and the line to Tarkio, MO, through Coin, IA. Service was maintained south of Clarinda until the 1950s and then was trimmed back to a branch serving Clarinda from the main line at Villisca, IA. This line survived a merger into the Burlington Northern but was abandoned in the 1980s. Clarinda now joins a growing list of county seats in Iowa without rail service. The southeast area of Clarinda was once dubbed "Gun Town" and remains known by that name today. A noted author wrote, "In the twenties and thirties, Clarinda seemed to be two separate towns: Guntown and Uptown. In the middle of the square was, and still is, the courthouse. The four blocks surrounding it are filled with businesses. Guntown was a town all its own. The 700 block of East Garfield was a solid block of businesses--grocery stores, barber, a Chinese restaurant, another restaurant on a corner, a rug factory, a large grocery, the Swifts packing plant, and railroad tracks with freight depot and roundhouse to turn trains around." Clarinda is located at (40.737599, -95.035928) along the West Nodaway River just north of the confluence of the East Nodaway River. According to the United States Census Bureau, the city has a total area of 5.22 square miles (13.52 km2), of which, 5.19 square miles (13.44 km2) is land and 0.03 square miles (0.08 km2) is water. As of the census of 2010, there were 5,572 people, 1,928 households, and 1,153 families residing in the city. The population density was 1,073.6 inhabitants per square mile (414.5/km2). There were 2,180 housing units at an average density of 420.0 per square mile (162.2/km2). The racial makeup of the city was 89.2% White, 5.6% African American, 1.1% Native American, 1.5% Asian, 0.1% Pacific Islander, 0.8% from other races, and 1.7% from two or more races. Hispanic or Latino of any race were 3.2% of the population. There were 1,928 households of which 26.1% had children under the age of 18 living with them, 45.3% were married couples living together, 10.2% had a female householder with no husband present, 4.4% had a male householder with no wife present, and 40.2% were non-families. 35.3% of all households were made up of individuals and 18% had someone living alone who was 65 years of age or older. The average household size was 2.19 and the average family size was 2.80. The median age in the city was 40 years. 21.1% of residents were under the age of 18; 8.9% were between the ages of 18 and 24; 26.4% were from 25 to 44; 25.6% were from 45 to 64; and 18% were 65 years of age or older. The gender makeup of the city was 57.6% male and 42.4% female. As of the census of 2000, there were 5,690 people, 2,017 households, and 1,246 families residing in the city. The population density was 1,096.1 people per square mile (423.3/km²). There were 2,188 housing units at an average density of 421.5 per square mile (162.8/km²). The racial makeup of the city was 92.02% White, 4.62% African American, 0.65% Native American, 1.09% Asian, 0.04% Pacific Islander, 0.51% from other races, and 1.07% from two or more races. Hispanic or Latino of any race were 1.41% of the population. There were 2,017 households out of which 27.5% had children under the age of 18 living with them, 49.4% were married couples living together, 9.8% had a female householder with no husband present, and 38.2% were non-families. 34.7% of all households were made up of individuals and 18.0% had someone living alone who was 65 years of age or older. The average household size was 2.21 and the average family size was 2.83. Age spread: 22.1% under the age of 18, 9.3% from 18 to 24, 29.8% from 25 to 44, 19.5% from 45 to 64, and 19.3% who were 65 years of age or older. The median age was 38 years. For every 100 females there were 121.7 males. For every 100 females age 18 and over, there were 122.2 males. The median income for a household in the city was $35,871, and the median income for a family was $43,654. Males had a median income of $35,061 versus $23,635 for females. The per capita income for the city was $15,136. About 9.9% of families and 16.3% of the population were below the poverty line, including 18.2% of those under age 18 and 6.6% of those age 65 or over. Clarinda, Iowa Facts for Kids. Kiddle Encyclopedia.